Waterpik Cordless Plus: Should You Buy This Water Flosser? The Waterpik Cordless Plus is one of the most popular cordless water flossers around – and with good reason. For such a portable flosser, it definitely packs a punch. Unlike full-sized countertop models, it’s easy to charge and takes up hardly any space (view on Amazon). As far as cordless flossers go, this Waterpik model is fairly stylish, with a choice of 4 different colours (white, black, blue and purple). It also features an ergonomic design, making it great for comfortable use. Water Pik are arguably the most well-known brand when it comes to water flossing. They’ve been a leading company concerning oral irrigation since 1962, and many of their products have been the subjects of solid clinical research. But with so many water flossers on the market, it can be difficult to know which one is best for you. Price can exceed $100 but more expensive doesn’t always mean better. It’s important to do your research to get best value for your money. The idea of a cordless water flosser sounds attractive, but does the Waterpik Cordless Plus successfully balance portability with effectiveness? We’ll find out in this review. How does the Waterpik Cordless Plus work? The Waterpik Cordless Plus works in the same way as many of the other Waterpik water flossers. Using award-winning and patented technology, the Cordless Plus ejects pressurized and pulsating water to clear away plaque and debris from hard to reach areas. Cordless flossers, like the Waterpik Cordless Plus are compact and require batteries or charging before use. Countertop models are much bulkier but more powerful, as they plug into a power source. Most water flossers that you’ll come across feature a “reservoir”. This is a space that needs filling up with water before you begin to floss. The Cordless Plus has just 2 pressure settings, compared to the usual 3 for cordless flossers. However, these pressure settings are in-handle and easy to switch between. It is important to remember that pressure is not the only measure of effectiveness in a water flosser. The water pulsating at 1450 pulses per minute ensures a thorough clean even on the lowest setting (view details). The Waterpik Cordless Plus has a 7 ounce reservoir which allows for 45 seconds of flossing time. While less than most countertop flossers, this is a good amount for a cordless water flosser. You can refill the reservoir if more time is required. Most water flossers come with just one or two tips. The Waterpik Cordless Plus comes with four. The different tips serve different purposes and specialize in improving oral health for various dental problems. Classic Jet Tip (x2). This is your basic and most frequently used water flossing tip. It fires a stream of water out, which cleans the plaque away from your teeth and gums. Orthodontic Tip. This tip has a tapered cluster of bristles, making it perfect for those who wear braces. Using the Waterpik Cordless Plus with this tip has been clinically proven to be up to 3x more effective than string floss for removing plaque around braces. Plaque Seeker Tip. This tip also has bristles, but these are designed for effective use on dental restorations. Using the Waterpik Cordless Plus with this tip has been clinically proven to be up to 2x more effective than string floss for improving gum health around implants. On top of this, the Waterpik Cordless Plus boasts tips that can rotate 360 degrees. This makes it ideal for reaching all areas of your mouth. It also means that you can avoid discomfort in the hand or wrist when flossing, as the tip rotates so that you don’t have to. The Waterpik Cordless Plus features 2 different pressure settings, which is ideal for when you’ve got a bit of stubborn plaque that doesn’t want to leave. Furthermore, this useful feature comes in-handle, making it easy to switch between different pressures during use. Whilst the Waterpik Cordless Plus may look like a large electric toothbrush, unlike many toothbrushes, it’s designed for comfort. It features an ergonomic design which makes it easy to hold and manoeuvre. There’s no denying that cordless flossers are the way to go if you’re a frequent traveller. When fully assembled, the Waterpik Cordless Plus clocks in at just under 12″. If you’re thinking that doesn’t sound small, remember it houses a reservoir, the flossing tip and batteries. Additionally, it won’t take up too much room in your suitcase and weighs significantly less than most water flossers. Not only does the Waterpik’s handy size make it appropriate for travelling; it’s ideal for smaller bathrooms or ones with limited counter space. The maximum base (with the reservoir included) is roughly the same size as your average smartphone. How does the Waterpik Cordless Plus compare? Who is the Waterpik Cordless Plus suitable for? The Waterpik Cordless Plus is a great option for anyone looking for a compact device that is effective but not expensive. It is remarkably competitive, even against its more expensive Waterpik counterparts but does have limitations in terms of pressure settings and strength. For those looking for more pressure within a portable device, the Waterpik Sidekick could be a great option for you. Sitting on the more expensive end of water flossers, it combines all the power of a countertop water flosser into a small, portable device. Waterpik is the #1 trusted water flossing brand amongst many dental professionals and home users alike. Their products are effective and also long lasting. When purchasing a Waterpik, you can be certain that you are investing in a product you can rely on. However, as with all products, the life of you Waterpik Cordless Plus can be maximized by using it correctly. Fill the reservoir. The reservoir is the water source for your flossing, so it’s important that you fill it up before use. This should last around 45 seconds – if you need more flossing time, just refill it and start again. Floss! Hold the water tip at a 90 degree angle to your gum line and turn on the flosser. Make sure to floss all areas of the mouth, as this helps to combat a build-up of plaque, which can ultimately lead to gum disease. If you are unfortunate and do encounter problems with your Waterpik Cordless Plus, the device is covered by a 2 year warranty. In real terms, this means that if you take the average retail price of $55 and divided it by the number of days it is guaranteed for (730), the maximum cost per day of using the Cordless Plus is $0.08. While this figure is definitely higher than cost of regular dental floss, it is important to consider two things. It is likely that your device will last significantly longer than 2 years, therefore lessening the cost per day. And also on Facebook and Twitter. So is the Waterpik Cordless Plus really worth it? If you’re looking for something that’s portable and easy to use, cordless models are the way to go. You won’t find many cordless water flossers as effective as the Waterpik Cordless Plus. Waterpik have also designed it for ease of use as well as contributing towards successful oral hygiene. The variety of tips and setting for different purposes makes it appropriate for people with a range of dental needs. The Waterpik Cordless Plus is supported by undisputed clinical evidence, making it a flosser you can definitely trust! 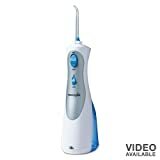 What voltage is the Waterpik Cordless Plus? The standard Waterpik Cordless Plus has 110. For alternative voltage, search for the UK version. Does this Waterpik have a charger? Yes, unlike the Waterpik Cordless Freedom (which requires replaceable conventional batteries), the Waterpik Cordless Plus has built in batteries and comes with a charger. This is similar to many electric toothbrushes. Is the Cordless Plus waterproof? The Cordless Plus is water resistant but not recommended for use in the shower. ViaJet Pro Oral Irrigator: Cheap and Cheerful, or Just Cheap?